Single room supplement @ $125 per night. Supplement for one angler with a guide @ $250 per day. 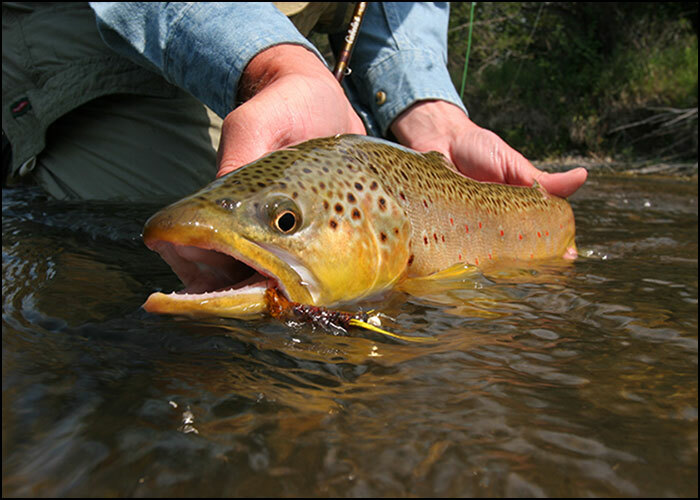 If you'd like to inquire about dates or have any questions about our lodge, waters, or fly fishing in Montana, please don't hesitate to call us at 1-800-378-5006 or email us at info@fiveriverslodge.com. Accommodations, meals, beverages, guided fishing, terminal tackle such as flies, leaders, tippet, etc., loaner equipment and laundry services. Fishing licenses, guide and staff gratuities, fly shop items, and private water fees. Airfares and airport shuttles. Airport shuttles can be arranged for an extra charge. Deposits. A 50% of the total package price is required within 15 days of making your reservation. The balance is due at the time of departure from the Lodge. Cancellations. If you must cancel your trip, a full refund will be issued if notice of cancellation is provided at least 120 days before your arrival. We do not provide refunds for trips of less time than your original reservation. Please consider trip cancellation insurance: We cannot make refunds due to medical, family or business emergencies or other unexpected events. Payment. We accept personal checks, cash, money orders, and traveler's checks. Sorry, We Do Not Accept Credit Cards.